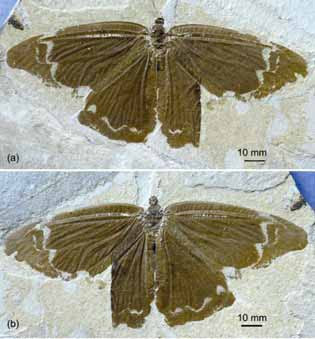 Meioneurites (Parameioneurites) spectabilis (from Engel, 2005). This image wasn't up ten minutes before being identified by Adam Yates. Meioneurites spectabilis is a member of the Jurassic butterfly-like lacewing family Kalligrammatidae. Kalligrammatids have been featured on Catalogue of Organisms previously. In the fossil above, you can see that kalligrammatids lacked the coiled proboscis of a butterfly (though their mouthparts are much more elongate than other lacewings, and kalligrammatids were probably nectar feeders like butterflies). Also, if you look very closely at the wings (you'd probably have to zoom in), you may be able to make out that there is a higher density of veins in the wings than in butterflies. For comparison, here's another kalligrammatid, Sophogramma lii, in a figure from Yang et al. (2009). Pretty. Engel, M. S. 2005. A remarkable kalligrammatid lacewing from the Upper Jurassic of Kazakhstan (Neuroptera: Kalligrammatidae). Transactions of the Kansas Academy of Science 108 (1-2): 59-62. Yang Q., Zhao Y.-Y. & Ren D. 2009. 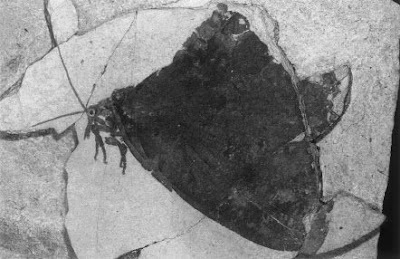 An exceptionally well-preserved fossil kalligrammatid from the Jehol Biota. Chinese Science Bulletin 54 (10): 1732-1737. My ignorance regarding paleobotanical matters is profound, so I'll have to ask... What kind of nectar was there to feed on in the (Upper) Jurassic? Some recent gymnosperms (cycads and Gnetales) are insect-pollinated and produce nectar-type secretions so it is quite possible that Jurassic gymnosperms may have too. Bennettitales in particular may have been nectar producers. Regarding Jurassic non-lepidopteran non-angiosperm pollinators: had I only waited with my question for a few days, a paper in the latest issue of Science (Ren et al., 2009) would have much enlightened me. Ren, D., Labandeira, C.C., Santiago-Blay, J.A., Rasnitsyn, A., Shih, C., Bashkuev, A., Logan, M.A.V., Hotton, C.L. & Dilcher, D. 2009. A probable pollination mode before angiosperms: Eurasian, long-proboscid scorpionflies. Science 326, 840-847.